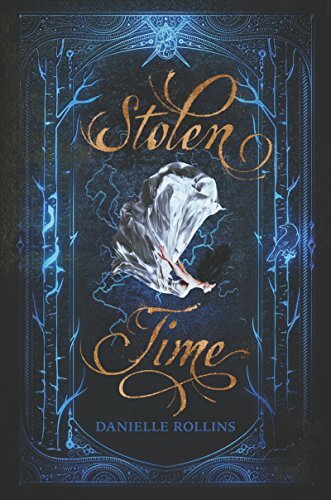 An intriguing start to a trilogy, Stolen Time is an action-filled time-travel caper. Author Danielle Rollins has obviously done her homework by quickly addressing the usual pitfalls of time-travel stories such as paradoxes and causality. She even pays homage to David Tennant's Doctor Who in her opening sequence featuring a runaway bride from 1913 stowing away on a time machine, the Second Star. The bride in question, Dorothy, is running from more than an unwanted marriage. She's running for her life, desperate for freedom from her sociopathic con artist mother who has groomed Dorothy to be her partner in crime. At first Dorothy simply wants to escape her mother's clutches, able to live her own life and see the world. But when the plane she stows away on turns out to be a time machine and its handsome pilot, Ash, brings her to the year 2077, she quickly realizes there's more than the world to explore—there's all of time as well. But 2077 isn't a futuristic paradise, as Dorothy finds when she wanders off on her own. "In the glowing dark, the white trees looked like cobwebs. In fact, this entire place gave the impression of something alive growing over the bones of a long-dead corpse." Ash along with his team, fellow teenagers yanked from their own time to help save the future, is desperately searching for his missing mentor, Dr. Zacharias Walker, the inventor of time travel technology. Ash has no time to waste on a stowaway despite the fact that she's gorgeous, smart, and courageous, although he can't ignore the troubling sense of deja vu that Dorothy awakes. Haunted by fore-knowledge of his own death at the hands of the woman he will fall in love with, a woman whose face is hidden to him, Ash is determined to never let his feelings get the better of him. Despite the meet-cute at the onset, Stolen Time quickly raises the stakes. In the year 2077 Seattle is a city half-underwater, and all of North America has been devastated by earthquakes and tsunamis. Dr. Walker predicted worse to come and set off on his own to save humanity's future, leaving his team of teen time travelers to fend for themselves. Rollins' brisk pacing and efficient choreography of action scenes leads the story through a variety of kidnapping, rescues, escapes, ambushes, and showdowns in both the present 2077 and the year 1980. However, the "twist" at the cliffhanger ending is telegraphed early on and obvious to any reader paying attention. Also, there is no resolution of either plot or character dilemma in this, the first installment of a trilogy. This first book is all setup and worldbuilding, which might deter readers more interested in character development and motivation. There are an extreme number of "why" questions never addressed, including why Roman, a genius level scientist, would betray his team and turn to the violent Black Cirkus instead of helping Ash and the others use their technology to save lives and the future of humanity. An action-packed time-travel romp, Stolen Time ends on a note sure to frustrate many. However, Rollin's deft prose may ultimately reward readers patient enough to wait for the next two books of the trilogy. New York Times and USA Today bestselling author CJ Lyons is the author of more than 40 books, most recently Trip Wire: A Renegade Justice Thriller. She is a former pediatric ER doctor. She also writes YA thrillers and science fiction under the pen name Cat Lyons.